Dealing with the aftermath of an accident is a huge challenge. Getting a car repaired becomes the most important thing, even before physical health. As humans we do not put enough emphasis on our physical health as we do with monetary items such as a car. Imagine how stressed you would be if you couldn’t drive for even a week! A great friend and chiropractic client of ours recently injured his quad and was unable to drive for several months. This wasn’t just a setback, but a huge impact on his daily life! We typically have to remind patients that it is just as important to get their body healed as it is to get their car fixed. Many patients struggle with insurance companies paying off their car for the value it is blue booked at or even getting their car fixed. During this struggle a common leverage point we’ve all seen insurance companies deal is to remove funding for the rental car. Most of the time this leaves the patient stranded and in a very stressful point where they are desperate to settle. Other times the patient may have PIP but not full coverage and unable to fix their car right away and are also very stressed as they do not have transportation. This creates an opportunity for you to boost the personal injury side of your practice! Be an angel and offer full transportation for Personal Injury Patients! Those who need it will be grateful and will become good patients. Many times patients are unable to make initial appointments nor to return for care simply because they don’t have transportation. In your personal injury marketing state: “Offering full transportation to and from your appointments. Simply call our office, explain your situation and we will quickly find a suitable solution.” This statement allows you to access the situation, learn who is at fault for the accident and what symptoms the person is experiencing. By providing a solution to their problems you become an angel. The best part is that patient will then spread the word to others about your kind, patient and caring practice! You will gain good patients that you wouldn’t have otherwise. In addition it makes you more credible as a Personal Injury practice. We do Personal Injury Marketing for practices all over the nation. The largest and most successful Chiropractic practices that offer PI all do similar tactics. Offering transportation is one of them. Sure it doesn’t work out for every patient and sometimes you will pay for transportation that doesn’t generate any return, but more often you will gain new quality PI patients! Some of our practices offer to pay for a taxi, while others have a designated van that they use to pick up patients. If you would like to learn more strategy on offering transportation, give us a call and we can help you work through the kinks. For more tips and insight to what successful chiropractic practices do to boost their personal injury marketing or other tactics, stay tuned to future posts. 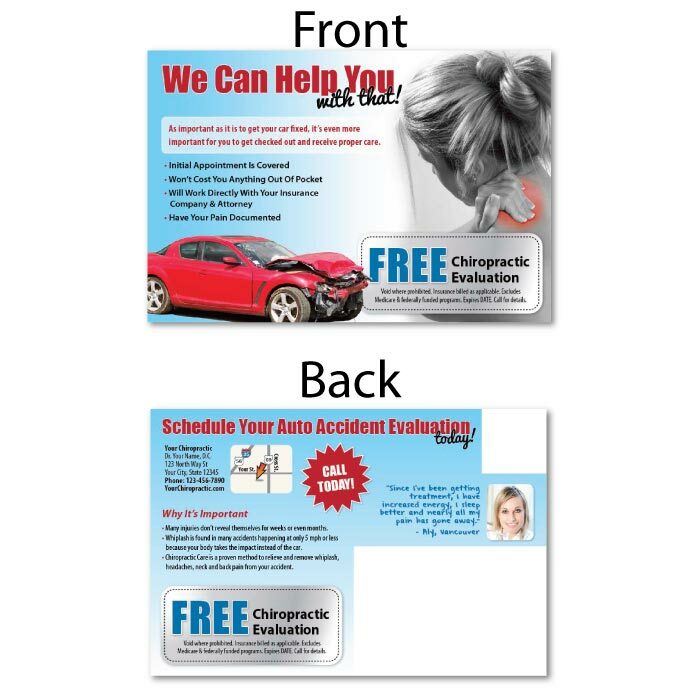 We have found sending Personal Injury Postcards to recent auto accidents is a great way to introduce your practice and explain why a patient should be evaluated after an accident. 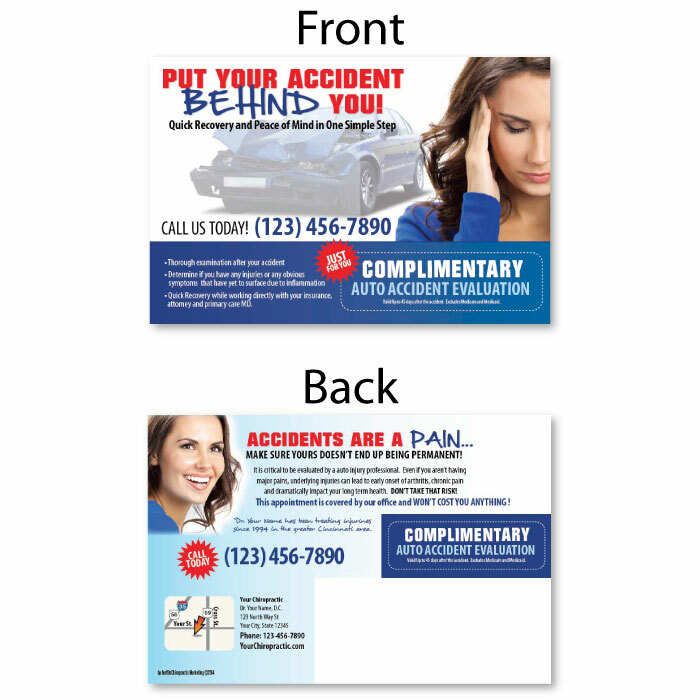 Offering transportation on your auto accident postcards significantly increases results! 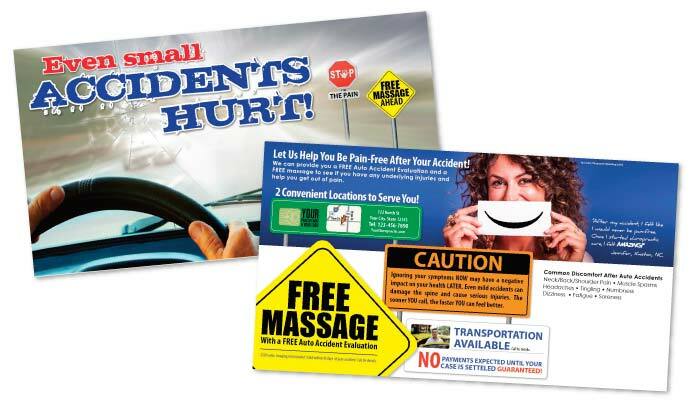 You can view and purchase personal injury postcards (aka auto accident postcards) in our online print store by CLICKING HERE.